Born: Gibraltar, Spain, 1960. Education: Studied design at St. Martin's School of Art, London. Career: Graduation collection, Les Incroyables, sold to Brown's; freelance designer, establishing John Galliano fashion house, London, from 1984; designer for haute couture and ready-to-wear at Givenchy 1995-96; designer for haute couture and ready-to-wear at Christian Dior, from 1996; opened own shop in Bergdorf Goodman store, 1997; licensed fur line, 1998; opened shop in Saks Fifth Avenue, 2000; launched watch collection, 2001. Exhibitions: John Galliano at Dior, [retrospective], Design Museum of London, 2001-02. Awards: British Designer of Year award 1986, 1994, 1995; Bath Costume Museum Dress of the Year award, 1987; Telva award, Spain, 1995; International Fashion Group, Master of Fashion, 1997; Designer of the Year, Council of Fashion of America, 1998. Address: 60 Rue d'Avron, 75020 Paris, France. Website: www.dior.com . McDowell, Colin, Galliano, New York, 1997. Watson, Linda, Vogue Twentieth Century Fashion: 100 Years of Style by Decade and Designer, London, 1999. Brampton, Sally, "Capital Collections: John Galliano," in Elle (London), March 1987. John Galliano, designed for the house of Christian Dior's fall/winter 2000-01 haute couture collection. Rumbold, Judy, "A Steal for Galliano," in The Guardian (London),14 October 1987. Mower, Sarah, "London Follows Galliano," in The Observer (London), 18 October 1987. Coleman, Alix, "Viva Galliano!" in the Sunday Express Magazine (London), 8 November 1987. Filmer, Deny, "Designer Focus: John Galliano," in Cosmopolitan (London), February 1988. Jobey, Liz, "John Galliano: Romantic Hero," in Vogue (London),February 1988. Brampton, Sally, "The Great Galliano," in Elle (London), March 1988. Irvine, Susan, "Galliano and Co.," in Harrods Magazine, Spring 1988. Gasperini, Nicoletta, "John Galliano's Golden Year," in Donna (Milan), April 1988. Collin, Matthew, "The Boy Wonder: An Interview with John Galliano," in i-D (London), November 1989. Rumbold, Judy, "Galliano Leaps onto Centre Stage," in The Guardian, 26 February 1990. Dickson, Elizabeth, "A Life in the Day of John Galliano," in the Sunday Times Magazine, 1 March 1992. Billen, Andrew, "Galliano: Can He Really Cut It?" in The Observer Magazine, 28 February 1993. Reed, Julia, "Incurable Romantic," in Vogue, March 1993. Ingrassia, Michele, with Meggan Dissly, "Dior Meets Disney World," in Newsweek, 26 December 1994. Mauriés, Patrick, "Ma Poulette, Quel Style," in Vogue (Paris), February 1995. "Sei Grande, Grande, Grande…/Nobody Does It Better," in Moda In (Modena), January-March 1995. Menkes, Suzy, "Show, Not Clothes, Becomes the Message," in the International Herald Tribune, 20 March 1995. Kerwin, Jessica, "Galliano in Gotham," in WWD, 23 May 1995. Weisman, Katherine, and Janet Ozzard, "The Galloping Galliano," in WWD, 9 September 1996. "Galliano Shop Bows with Bergdorf Gala," in WWD, 11 December 1997. "Galliano Sets Fur Line Debut," in WWD, 4 May 1998. 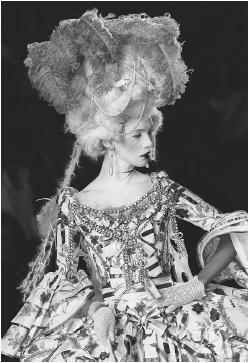 Weisman, Katherine, "Galliano's Open-Dior Policy," in WWD, 3December 1999. Dowd, Maureen, "Haute Homeless," in the New York Times, 23January 2000. Givhan, Robin, "In Paris, Clothes Aren't Everything," in the Washington Post, 14 October 2000. Rubenstein, Hal, "The Look of Christian Dior," in In Style, 1November 2000. Socha, Miles, "The Galliano Factor: Dior Lays Groundwork for 'Exceptional' 2001," in WWD, 16 January 2001. "Born Again Christians," in Time International, 19 February 2001. Sischy, Ingrid, "Inside Paris Fashion: John Galliano," in Interview, October 2001. Experimental and innovative, John Galliano has become internationally renowned as one of Britain's most exciting designers, acclaimed from the start for his brilliance in cut and magpie-like ability to take inspiration from diverse sources to create a completely new look. Although his clothes are often difficult to understand when on the hanger—with collars that seem to be bows or halter necks that actually fit over the shoulders—they are frequently ahead of the current fashion trends and eventually filter down the clothing chain to the High Street, as well as being picked up by other designers. A favorite among fashion aficionados, Galliano was spotted as soon as his first student collection was completed and has continued to develop since, despite repeated problems with backers who have hampered his career. John Galliano, designed for the house of Christian Dior's spring/summer 2001 haute couture collection. great belief in the necessity to push fashion forward by learning from the past—coupled with his skill at balancing his designs with modern ideals—has earned him the reputation of a prodigy. Every outfit is thought out to the last detail, producing a series of completely accessorized looks as Galliano constantly strives for perfection. His love of bias cut gives added fluidity to the asymmetrical hemlines of many of his designs, with a taste of 18th-century dandyism thrown in, always with a surprise twist—often in his use of fabric, another area where Galliano loves to experiment and challenge. In one collection, he presented Napoleon-style jackets in bright neoprene, in another, devoré velvet bias-cut dresses clinging to the body, giving the element of sexiness that pervades his work. His love of shock gave us the camped-up glamour of his "underwear as outerwear," with satin knickers worn with feathered bras and leather caps, tapping the trend for drag in the London clubs. With Galliano's Girl and, perhaps to an even greater extent, the largely denim and Lycra-based line Galliano Genes, the designer demonstrated his ability to redefine existing subcultures to develop clothes for the younger, funkier sisters of his mainline buyers. Produced at a cheaper cost by using less exclusive fabrics, these designs are nonetheless inventive. Three-way jackets can be worn with attached waistcoats outside or inside, and there are other basic items more commercially viable, confronting occasional claims from his critics that his work is too avant-garde and less popular than other European names. The sheer breadth of vision in Galliano's designs, which frequently rethink form and shape, and the great inventiveness of his cut have surely ensured his reputation as one of the best of British designers. The research he does before forming a collection—bringing together influences and details from the French Revolution to Afghan bankers to Paul Poiret—and his experimentation with fabrics demonstrate his dedication to pushing fashion and dress forward, yielding excitement and surprise in every collection. Galliano stunned the fashion world in 1995 when he was named designer for Givenchy and became the first British designer appointed to lead an established French fashion house. In addition to designing for both haute couture and ready-to-wear at Givenchy, Galliano continued to show designs under his own label. By October 1996, the LVMH group moved Galliano to its crown jewel and appointed Galliano designer for haute couture and ready-to-wear collections at Christian Dior. Critics questioned whether Galliano's maverick reputation would appeal to Dior's established clientéle, but the designer arrived with the energy to shake up the haute couture world, which was showing signs of losing the interest, and sales, of its customers. In his spring/summer 1997 collection, Galliano took classic Dior themes and spun them together with exotic African Masai tribal forms to create silk evening dresses accented with colorful beaded choker necklaces. The collection presented a younger image yet remained glamorous and refined, definitely worthy of the Dior name. Galliano's collections have never failed to enchant, or shock, audiences. Each has expressed a theme complete with historic personalities and forces that have inspired Galliano's creations for the season. Edwardian elegance, the surrealist movement, the Soviet or Red Guard, the movie The Matrix, or classic English sportsmen have all been at play in Galliano collections. His push for a more contemporary, sexier image has proven at times to be a difficult and frightening change at Dior. In addition to his extravagant romanticism and love of the bias-cut gown, Galliano still retained much of his British bad boy flair. He drew public ire when the homeless theme in his spring 2000 collection included models in newspapers carrying empty liquor bottles and, in the following year's spring collection, when runway models were accompanied by blared vulgar lyrics offering women for sale. Even his critics acknowledge Galliano has brought excitement and fun to haute couture, and customer interest may be his best vindication—by 2001 Dior sales had doubled since the arrival of Galliano four years earlier. The ever-inventive Galliano will continue to hold the fashion world's attention and certainly keep it guessing for years to come. May I take the opportunity to correct a small part of the article above. Please, Gibraltar, is NOT, part of Spain, it is a British Terratory. A general comment if you will - Is it possible to see images of top coats John Galliano designed - either 2008 or 2009 - I bought a beautiful black wool coat when in Dallas Texas Christmas/New Year 2009 and would like to identify the cloth and removable fur collar. Lapels are wide, fitted at the waist with a belt and A style skirt, silk lined.